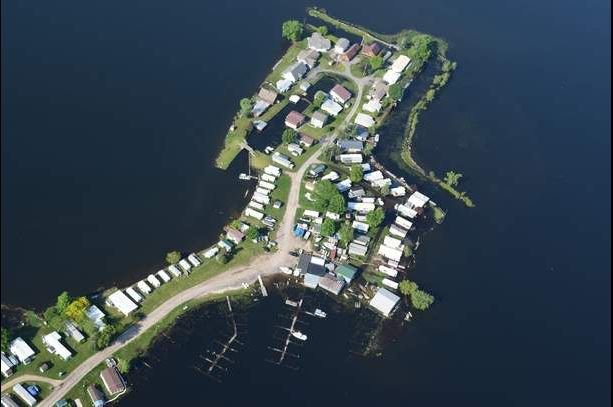 "North Pond Resiliency Project" Project: A collection of aerial imagery shows the damage caused by high water at North Sandy Pond and eastern Lake Ontario. Among them is damage to the Greene Point Marina, Sandy Creek, changes to the pond's inlet, and erosion of critical dunes. Credit: Watertown Daily Times. Sandy Creek, NY, June 25, 2017 — High above Lake Ontario, researchers Thomas Hart and Geoffrey Steadman have taken notes, captured images and assessed the shoreline below. The insights from their flights and ground-level analysis may help show the changes to the shoreline around North Sandy Pond, and how officials can manage the lake’s shoreline. The pair, who first worked together in the late 1980s on state-funded research of the lake, are currently nearing the end of a two-year study to assess conditions in the pond area. Their research covers an approximately four-mile stretch of shoreline from just south of Sandy Island Beach State Park up to Cranberry Pond in Mannsville. 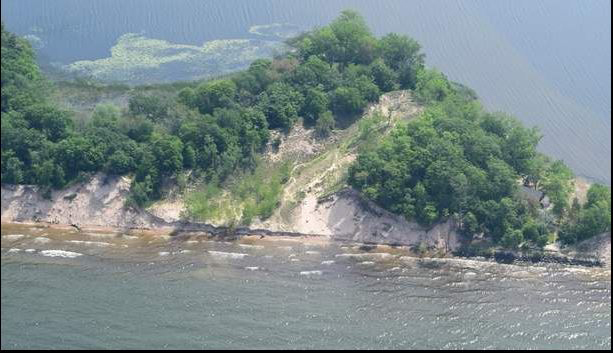 In addition to collecting aerial imagery across the lake, most recently on June 12, and digital maps representing several years, the pair will look to assess sand buildup in the pond’s shore area, including areas like Carl Island. “Can we use that to tell us what’s going to happen in the future, and to plan for that?” said Mr. Steadman. One area of change at North Sandy Pond has been its inlet, which Mr. Hart said has changed locations multiple times in about the last century. “The main question is what effort do you make to keep the inlet the way it is, and what happens when new inlets form?” he said. 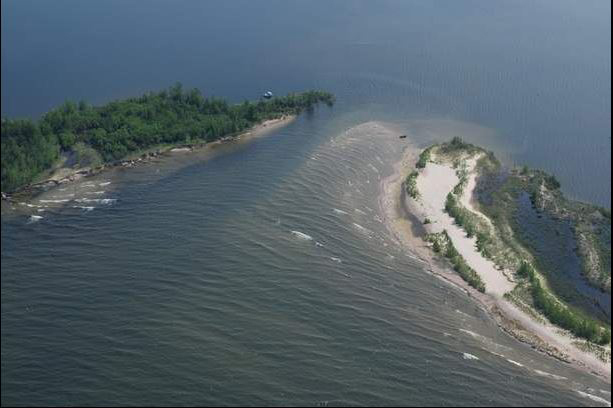 The pair noted their work is just the latest in decades of research along the shore, which has been paired with efforts from environmental groups like the Eastern Lake Ontario Dune Coalition and the Ontario Dune Coalition to help conserve sand dune, wetland, and barrier beach resources and related wildlife. 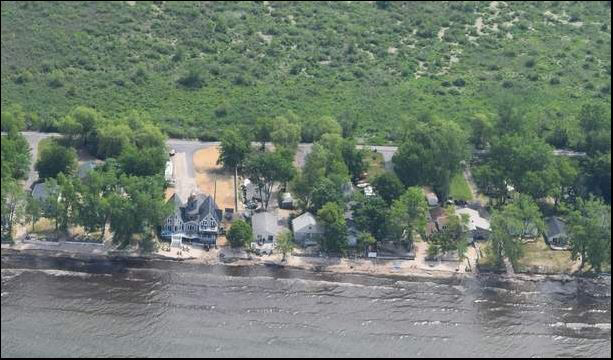 Among the successes noted by the researchers was the development of Sandy Island Beach State Park. “We all want to manage it so wildlife and people can coexist, and in some ways we’ve been pretty successful,” Mr. Hart said. The pair hope to release the findings of their latest work within the next few months. “We have to get this information to people that aren’t technical, and it explain to the public at large,” Mr. Hart said. The pair’s work is supported by a $25,000 Great Lakes Basin Small Grant to the Oswego County Soil and Water Conservation District. The grant is backed by the state Environmental Protection Fund and Environmental Conservation Program, and was announced by the state Department of Environmental Conservation and New York Sea Grant. The shoreline of Jefferson Park, Ellisburg, which sits on Lake Ontario, on June 12. The high water levels have threatened homes and businesses across the lake. An aerial view of the high dunes on the North Pond coastal barrier on June 12, which are described as the largest in New York and the second largest in the northeastern United States. High water levels on Lake Ontario are eroding the dunes, according to researchers. 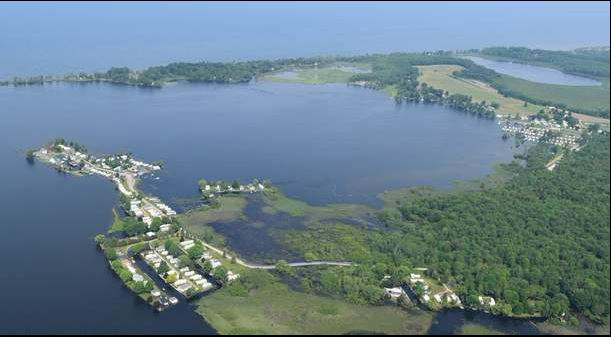 An image of Greene Point Marina from the air on June 12 shows docks under water and yards submerged. An aerial view of the North Pond Inlet on June 12, with water covering the sand flat at the north end of the south barrier spit and also covering part of the vegetated barrier. This website was developed with funding from the Environmental Protection Fund, in support of the Ocean and Great Lakes Ecosystem Conservation Act of 2006.